This recipe comes from Melissa d'Arabian the winner of season five of "The Next Food Network Stars". 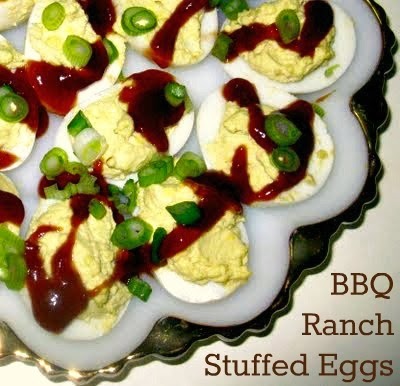 I immediately wanted to make these BBQ Ranch Stuffed Eggs as soon as I saw her making them on her new show Ten Dollar Dinners. A quick, inexpensive appetizer, and a great twist on an already family favorite. 1. Always put a single layer of eggs in a saucepan and do not crowd. If eggs are cold from the refrigerator fill the pot with cold water. If the eggs are from the counter or at room temperature fill the pot with room temperature water. 2. Bring water to a boil and boil for 3 minutes. 3. Remove pot from the burner. Put a lid on the pot and let set undisturbed for 15 minutes. 4. Pour water off of the eggs holding the lid to keep eggs from falling out. 5. With the eggs still in the pot gently shake them against the sides of the pan and up and down to crack the shell around the hot eggs. 6. Put the pot with the cracked eggs under the faucet and run cold water (very important that the water is cold) over the eggs. Let set 3-5 minutes or until eggs are cool enough to peel. Peel eggs under cold running water. Slice the eggs in half lengthwise, putting the yolks in a medium bowl and the whites on an egg platter. Use a fork to mash the yolks and mix in the mayonnaise, mustard, ranch dressing, and instant potatoes. Place the yolk mixture into a sturdy resealable plastic bag, push into one corner, and cut off the tip to make a pastry bag. Pipe the yolk mixture into the whites. Drizzle the BBQ sauce over the eggs using a squeeze bottle (or make another little pastry bag and cut out just a tiny tip for the sauce). Sprinkle with the green onions and serve. those stuffed eggs look real good! Those eggs look so good and different, we will sure have to give them a try. Hope you are having a great week and thanks so much for sharing with Full Plate Thursday. Cool! 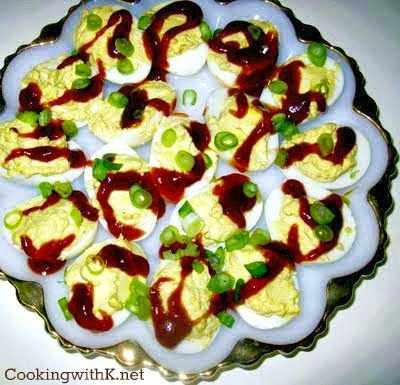 We love deviled eggs around here. I love the idea of the ranch and barbecue sauce. Thanks for sharing on Sweet Indulgences Sunday. Yummy! New follower here from More the Merrier Monday. Great tips for cooking perfect hard boiled eggs! I remember watching Melissa on The Next Foodnetwork Star and rooting for her! Thanks for joining ON THE MENU MONDAY and bringing the hard boiled eggs! It looks so yummy! 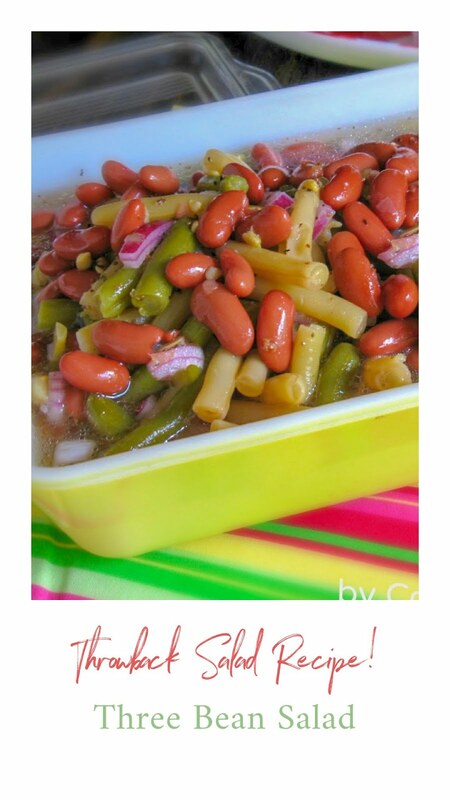 Thanks for the lovely recipe. What an interesting twist on an old favorite! I am filing this away for future use. 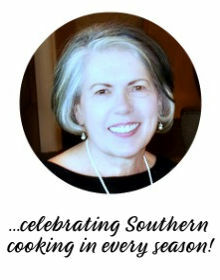 Thank you for sharing this delicious recipe with the Hearth and Soul Hop. 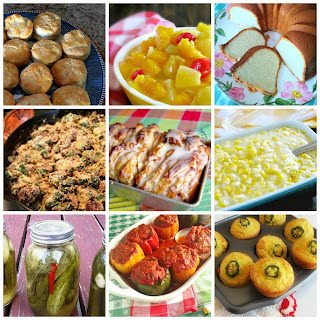 I featured this recipe over at this week's Makin' You Crave Monday, so come on over & check it out once you get some time. Also, I would love it if you linked up again this week!